Something special has journeyed to Islington and I have been on tenterhooks awaiting its arrival since the announcement of its Hoxton Square closure. Welcome one and all to The Dead Dolls House which now has a permanent spot on Upper Street and is most certainly the place to be! Polish your jazz shoes, grab your favourite people and shimmy on over to the Victorian dolls house you'll wonder how you ever lived without. It’s all black and white walls, cut glass and candles (spot my googly eyed pal), espresso martinis, Sunday roasts and intricately illustrated frames and fireplaces. The top floor is home to a members club with a difference and just like their first venue, entry is dependent upon bringing a gift to add an extra sparkle to their bar. (Head over to their gift list to find out what they need.) The other floors are open to all and are worth a visit if not only to ogle at the beauty of the venue! My love for their sister venue; The Arch in Bethnal Green has been replicated, due in (large) part to the arrival of the ever fabulous Kansas Smitty’s – the Jazz band of the moment who’ll get those feet tappin’ and lips grinnin’ in no time. 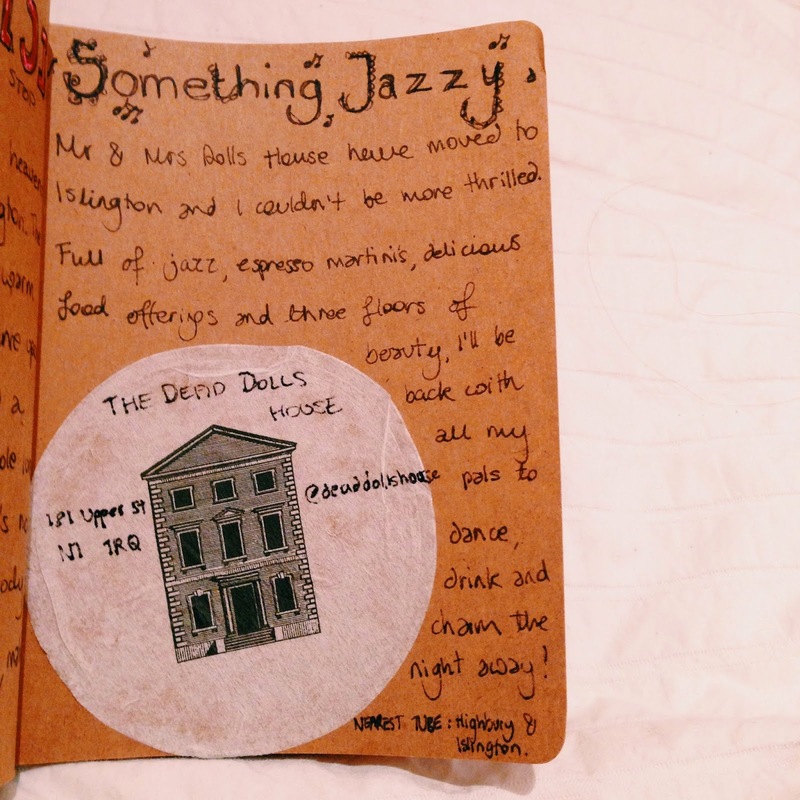 Negroni’s, Old Fashioned’s and Martini’s flowed while enviable nibbles made their way around the different rooms of the dolls house to the sound of the Jazz below. (Check out the musings from all the above if you’re in need of further London boozy, foodie tips)! It is impossible not to fall in love with a place where care and attention to detail oozes from every corner and Mr & Mrs Dolls House (Adam and Kate) deserve every ounce of praise for the impressively speedy transformation of what used to be a rather tired House of Wolf into the liveliest, zaniest, most beautiful house on the street! With space for 400, their new house is open until 4am (Thurs-Sat) where Thursdays and Sundays (till 2am) will play host to live Jazz and then DJ’s spinning on Fridays and Saturdays. On Wednesdays it's food night where Daryl Wilson is at the helm of the kitchen. He'll also be throwing his hat into the ring for the finest Sunday lunch alongside a lighter bar menu for the rest of the week, so watch this space, looks like I might have found my new weekend hangout .. who am I kidding, you'll have to tear me away! Club, bar, restaurant, home. You have all you need in The Dead Dolls House. I need to get to this place! Looks like a dream. Good cocktails and jazz, yes please! Absolutely! Everything just totally hits the spot. Get on board the members train to have access to the top room, it's just deeelightful!